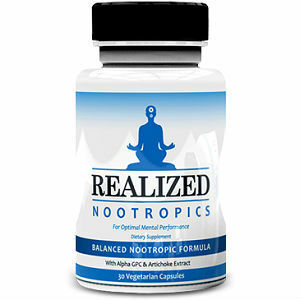 This is a review of the supplement Realized Nootropics Balanced Nootropic Formula. The manufacturer claims that this product enhances memory recall, creativity, productivity, and concentration. It also boosts focus, enhances brain function, neutralizes the effects of oxidative stress, and increases brain blood flow. You will learn more about this product as you continue reading this review. Bacopa Monnieri– Clears brain fog, helps the mind to relax, and increases memory. L-Theanine- Enhances brain activity, improves focus, and reduces drowsiness. It also provides energy. Huperzia Serrata- Increases attention, concentration, and learning ability. It also reduces cognitive decline. Alpha GPC – Supports brain functions, enhances cognition, and helps in learning and memory. Forskolin- Helps in supporting brain functions, increasing memory formation, and improving the ability to retain information. L-Tyrosine- Reduces cognitive function decline and plays a part in the generation of nerve impulses. Acetyl-L-carnitine- Balances the effects of high amounts of acetylcholinesterase. Artichoke extract- Breaks down CREB leading to the activation of cAMP. Increased amounts of cAMP enhance memory and learning by improving long-term potentiation. Phosphatidylserine- Enhances cognitive functions and reduce stress. Oat Straw- Contributes to a stress-free and relaxed mind. Pterostilbene- Protects the brain from mental fog and free radicals. Vitamin B6- Essential for enzyme reactions, brain development, and immune function. Users should take 1 or 2 capsules during morning hours to improve mental performance. You can also take the same dosage before sleep to enhance dream state. It is recommended to take the capsules with a light meal. You should not exceed 4 capsules in a period of 24 hours. A one-month supply of 2 bottles with 30 capsules each costs $49.49. A three-month supply of 2 bottles with 90 capsules each costs $30.00 per month. A 5-month supply of 2 bottles with 30 capsules costs $26.98 per month. The manufacturer promises 100% satisfaction guarantee. You can return the product for a total refund of the purchase amount if you are not satisfied with the results. This guarantee implies that you should not worry about losing your money. There are also positive reviews from satisfied customers meaning that this product is effective. Realized Nootropics is a top-notch product that enhances memory recall, productivity, creativity, concentration, focus, brain function, and brain flow. It can also reduce stress. Its indisputable positive aspects include high concentrations of the main ingredients, 100 percent satisfaction guarantee, discounted prices, and positive customer reviews. This product also uses natural ingredients, which are safe for consumption. It also uses ingrediants that vegetarians can consume. However, there is no information about the possible side effects, which may be a major concern for first-time users. Moreover, there is no information about GMP certification. Nevertheless, the merits of this product are more than the drawbacks, which makes it a suitable product. Henry Costa	reviewed Realized Nootropics	on June 29th	 and gave it a rating of 3.5.